1. Mix the rolled oats and coconut in a nonstick pan. Toast it over medium heat for a few minutes until the mixture gets slightly golden, and the coconut will get fragrant. Transfer to a bowl and set aside. 2. In the same pan melt coconut oil. Add the maple syrup and stir well until thoroughly combined. Next, add the cacao powder and stir well. You want smooth chocolate sauce without any chunks. 3. Return the oats and coconut mixture to the pan and mix well with the chocolate sauce. Leave on the medium heat for few more minutes, stir occasionally. Add cranberries at last. 4. 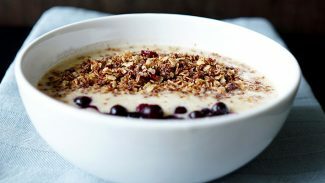 Turn off the heat and let the granola to cool before transferring it to an airtight container where you can keep it up to a week. Enjoy!